Entrepreneur, publishing expert, communications trainer and consultant for strategic communication and leadership, Antje Meyer has over 30 years of experience in the creative industry. 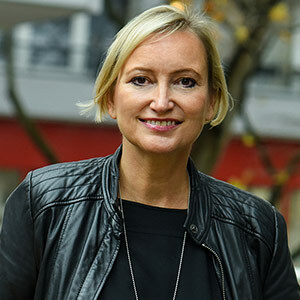 Today she is director of communications agency orangeblue relations in Berlin and has consultancy experience with over 100 companies, professional bodies and institutions in the food, energy, services and creative industries. Approved trainer for change and development processes, focusing on creative team processes. Initiator and CSR speaker for the Berlin Chamber of Commerce (IHK) since 2007, including the development of 'Berlin CSR Day'. Excellent network in the German sustainability sector, speaker and moderator of various CSR events. Antje is also a co-initiator of the German Actors Award (‘Deutscher Schauspielpreis’ since 2011) and member of the supervisory board for the Hebbel Theater am Ufer (HAU) in Berlin. She is lecturer for Corporate Communications and CSR at various institutions including HTW Chur in Switzerland.